2 1/2" wide face bay window curtain rods. Sides 18" 38", center 36" 66", Clearance 3.5- 5", white finish. Includes 3 supports plus corner supports, comes with installation instructions. Continental I Kirsch curtain rods 86"-150"
4 1/2" wide face, extra long curtain rods. 4 1/2" wide. Clearance 4 1/2" to 5 1/4" or 7 1/2". A Kirsch curtain rod. Use behind traverse rod to create a double curtain rod application. White finish. Use with Cirmosa Decorative or White Traverse Rods. Kirsch curtain rods. See different size and shapes curtain rod brackets for wood and metal curtain rods. Project 2 3/4 4 1/4 inches inside and 6 1/4 to 8 1/2 inches outside rod. White finish. Clearance 2 to 3 1/2 inches inner and 6 to 8 1/4 inches outer. Pocket size 3 to 3 1/2 inches. Heavy Duty Rod. A double curtain rod combination for a traverse rod layered wide pocket topper valance treatment. Clearance 2 to 3 1/2 inches inner and 6 8 1/4 inches outer. Pocket size 3 to 3 1/2 inches. Made of heavy .0165 gauge steel. Laced with heavy duty braided cord. Standard cord length is 7 feet on all Graber traverse rods. Drapery double rods. Use for corner curtain rod installations or bay window. Five finishes: Black, Rust, Iron Oxide, Iron Gold, and Antique Pewter. Swivels to any angle from 180 to 90 degrees. Fluted rings 2 5/8 inch inside diameter, 4 1/4 inch outer diameter. Renaissance Collection by Design Elements. Order in 12 foot increments White finish extruded aluminum curtain rod. Baton draw, ceiling mount. For pinch pleat or Ripplefold systems. Note: Included with rods, converts screw in finials for decorative traverse rods. Use when buying poles only. Decorative traverse rods smooth rod plain slides 38"-66"
1-3/8" rossette smooth decorative traverse rods 38"-66"
Adjustable traverse rod. Clearance 2 1/2" to 3 1/2", return 3 1/2" to 4 1/2". Complete set, ready to install. Rods are metal, finial and slides are plastic. Includes 16 rings, brackets and finial. 51316C: 1-3/8" rossette smooth decorative traverse rods 66" to 120"
Extra long tension rod for curtains or shower curtains. Spring pressure. Plated and painted white with optional fixed bracket. 6764-025: Continental II shower curtain rods 36-60 inches"
Combination sets include rod, brackets, finial and 4 rings per foot. Wood drapery rods. Use as swag curtain rod. Modern curtain rods. Elizabethan finial for1 inch metal curtain rods. 5 inches long by 2 5/8 inches wide. Made of resin. Brass finish. Clearance 2 to 3 inches, returns 2 1/2 to 3 1/2 inches. A cafe curtain rod by Kirsch. 5767-063: 13/16" Cafe window curtain rod 86"-150"
Wood drapery rods. Use as swag curtain rod. Modern curtain rods. Kirsch's reputation for quality and elegance was built on Wood Trends. These classic styles in rich colors and subtle grains complement wood furniture finishes and architectural details, allowing for a totally original design statement. With a wide assortment of components such as elbow brackets, swivel sockets and holdbacks, Wood Trends is not only timely but also functional. Note: Some colors have surcharge added." Use to attach your curtains to a cafe rod up to 1/2 inch in diameter. Spring clip attaches to the top of your curtain. 14 rings per bag. 3/4' inside measure." Graber drapery rods. Bright brass finish, projects 3 1/2 to 4 1/2 inches, clearance 2 1/2 to 3 1/2 inches. Rods are metal, slides and finials are plastic. Extra slides available sku 1-428. 1 1/2 inch Elegance II. drapery hardware collection by Graber." Minimum 12 foot increments. White finished anodized aluminum. Baton draw, ceiling mount. For pinch pleat, ripplefold and grommeted systems. Also available in 14 and 16 foot lengths. Clear sash curtain rod 20"-36"
Spring tension for easy installation.You can order one, or get a price break by ordering 4. This is a spring pressure 2 1/2' wide, white finish curtain rod. 6765-025: Continental II bathroom curtain rod 58-65 inches"
Use with tab top curtains, tie top curtains, eyelet curtains or pinch pleat draperies. The wrought iron collection by Kirsch is designed for single and double curtain treatments. Good for kids curtain rods. It also works nicely for corner curtain treatments using the swivel socket to connect the curtain rods in the corners. Even bay window can use this elegant solution. Single and double brackets, holdbacks, rings, finials and a stoutly made 1' rod dazzle in five finishes: Black curtain rods, Rust, Iron Oxide, Iron Gold, and Antique Pewter. 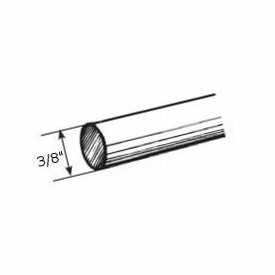 1 3/8" Select reeded wood poles 120"
Select wood curtain rod pole 1 3/8" diameter. Available in 4,6,8 and 12 foot lengths. Ten colors to select from plus unfinished. Base Price is for unfinished rods. Colors will show price in the cart. Note: 12' rods have to be shipped by truck. Metal rings for Select Wood 1 3/8" diameter wooden curtain rods. I.D. 1 3/4", O.D. 2 1/4". 7 rings per pack. Note: base price for unfinished, colors are more and will display price in cart. Wood brackets for Select Wood 1 3/8" diameter wooden curtain rods. 3 3/4" H , 3 1/2" return. Note: base price for unfinished, colors are more and will display price in cart.